Honyaki knives feature blades forged entirely from Hagane, the hard carbon steel and are fashioned with all the craftsmanship traditionally applied to the samurai swords. On these blades one can see the homon, the beautiful "ripple pattern." Honyaki knives require more skill and effort to sharpen, but the edge will remain sharp for a long time. Honyaki knives are durable and can be expected to last ten to fifteen years of professional use. 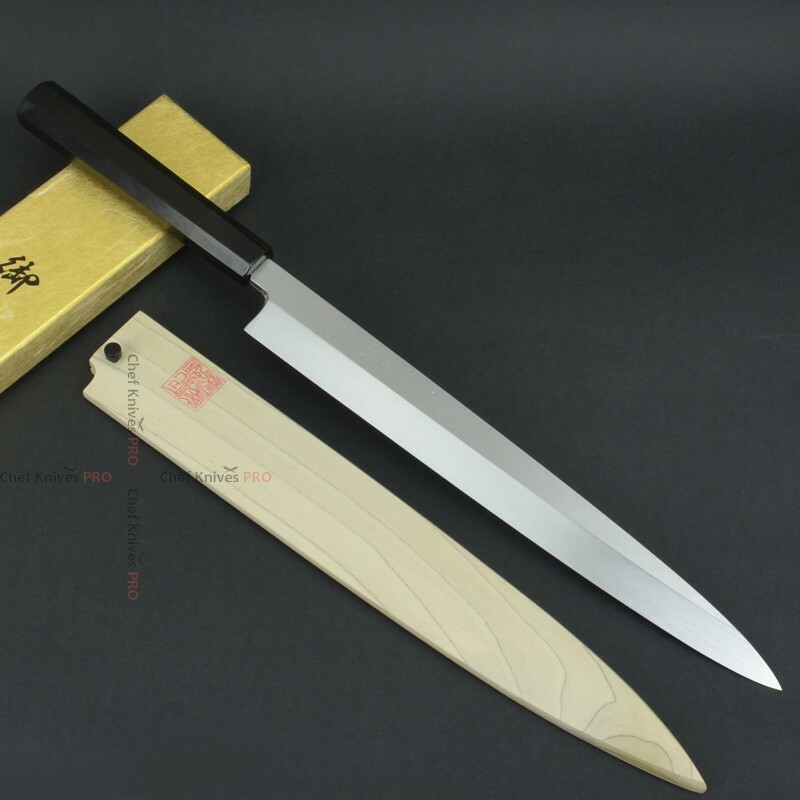 Honyaki knives can be ordered either Aoko (blue carbon steel) or Shiroko (white carbon steel). Aoko is the highest grade carbon steel used for cutlery today. 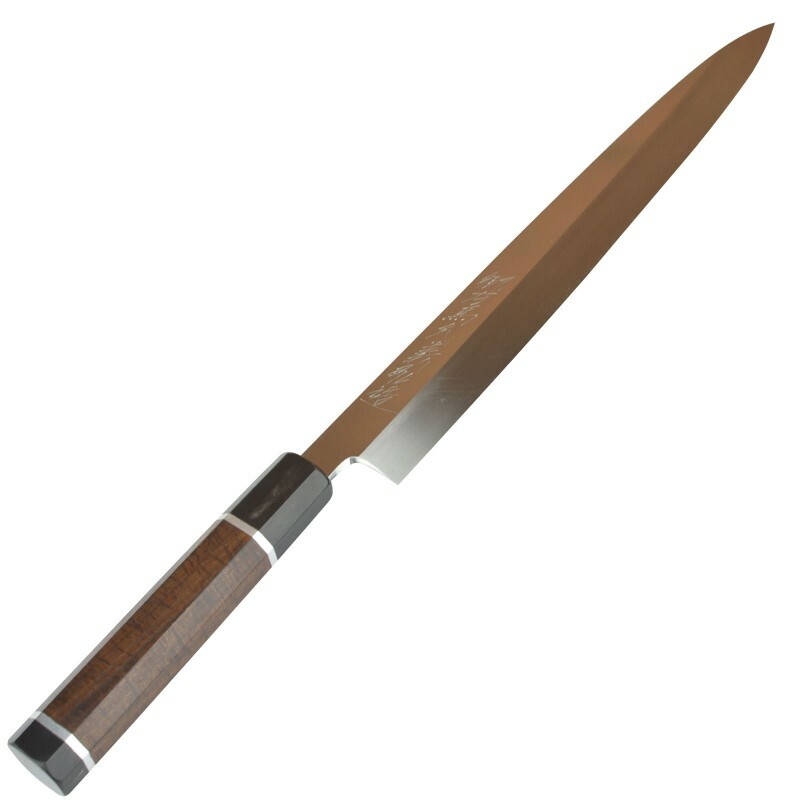 However, Shiroko is easier to sharpening for daily use and more popular among the traditional Japanese chefs. Honyaki is forged entirely from Hagane which requires special skills and experience. Goh-Umanosuku- Water Quenching -Honyaki Yanagiba 300 mm ebony handle with Wooden cover/SayaHRC - 64-..
Goh-Umanosuku- Water Quenching -Honyaki Yanagiba 300 mm with Wooden cover/SayaHRC - 64-65Grade ..
Goh-Umanosuku- Water Quenching -Honyaki Yanagiba 270mm ebony handle with Wooden cover/SayaHRC - 64-6..